Robert joined Cushman & Wakefield | CRESCO Real Estate as a Senior Sales Associate in 2012 specializing in industrial properties and vacant land acquisition and sales. He has been working in the Greater Cleveland real estate development industry for over twenty (20) years and has over fifteen (15) years experience in real estate brokerage. Bob’s experience in commercial real estate development provides him with the expertise to handle a variety of corporate and private real estate transactions. Bob has successfully completed an array of transactions for both small and large clients throughout Northeast Ohio with an unprecedented level of customer satisfaction. Bob takes extra care in listening to his clients’ objectives and then putting a carefully prepared plan together to maximize results. His area of expertise includes representation for acquisition and/or disposition of existing properties, design and construction of new buildings and consultation on land development projects. 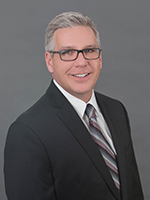 Before joining CRESCO, Robert was a Broker Associate at NAI Daus, where he focused on industrial properties and vacant land acquisition and sales. Bob has also served as Principal Broker for Parkside Realty and Principal of Parkside Builders. Prior to Bob’s career as a Commercial Broker, he was Vice President of Operations at Central Contracting Corporation, where he focused on the installation of improvements for land development projects.